Stagnation of liver qi and blood causing costal fullness, poor circulation, cold feet and hands, belching, nausea, loose stool, gastritis, epigastric or abdominal pain, premenstrual syndrome (PMS) and hepatomegaly. Chronic hepatitis, gallbladder inflammation, ulcer, mastitis and fibrocystic breast are some of the imbalances satisfied clients have used this product for. 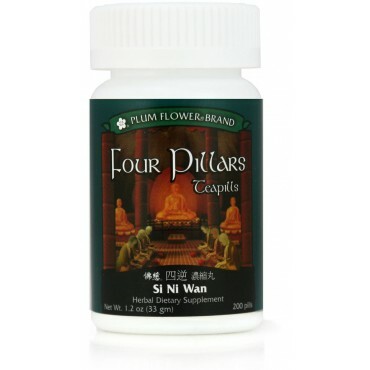 Dredges the Liver, Soothes the Liver, Harmonizes the Liver and Spleen, Invigorates Blood, Moves Liver Qi, Regulates Liver and Spleen, Clears Heat from the Interior. Paeonia lactiflora root, Bupleurum chinense root, Citrus aurantium fruit-immature, Glycyrrhiza uralensis root-prep, Activated carbon, Botanical wax, Talcum. - Bai shao, Chai hu, Zhi shi, Zhi gan cao, Activated carbon, Botanical wax, Talcum. Contraindicated during the early stages of acute infection or illness, such as cold or flu. Contraindicated for very weak or deficient individuals. Use with caution during pregnancy. Use with caution in Spleen Qi deficiency.